Had a super fun morning getting ready for our Top Producer Collective video call today which includes “hot seats” where we discuss issues and solutions in an open forum. This is after I called 29 contacts in my SOI (sphere of influence) wishing them a happy new year and asking them for referrals. And what I love doing also is mixing up my calls to my SOI with something that is mightier than a sword! Do you know how many times I have been complimented by writing a hand note to my SOI? I received one new listing in 2018 directly related to a hand note. This seller was so impressed with my handwritten notes I had sent out to them. They said they never receive notes in the mail. See, the pen is mightier than the sword! Many of the Epic agents in the Top Producer Collective are doing this right now. 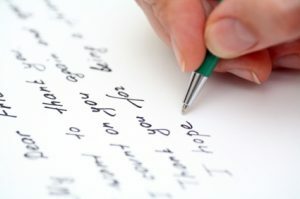 If you want to set yourself apart from the other listing agents, send handwritten notes. Send notes to your SOI. Send them to your seller prospects. Send them to your lover. All these people will love you for it!